The Israeli Comix industry, though small, seems to be much more open towards, and interested in, foreign markets than other segments of the Israeli literary or publishing spheres. This must have something to do with the nature of the visual medium (though it's not without its share of problems - since Hebrew is written right to left panels often have to be reversed as well as translated, which could throw off the whole composition of the page), but I think a major factor was the foundation of the Actus Tragicus Comics Collective. This group of five Israeli comics artists was founded in 1995 by Rutu Modan and Yirmi Pinkus (who first collaborated on the failed attempt to create an Israeli version of Mad magazine ), with the explicit goal of enabling its members to reach an international audience by publishing their own books. 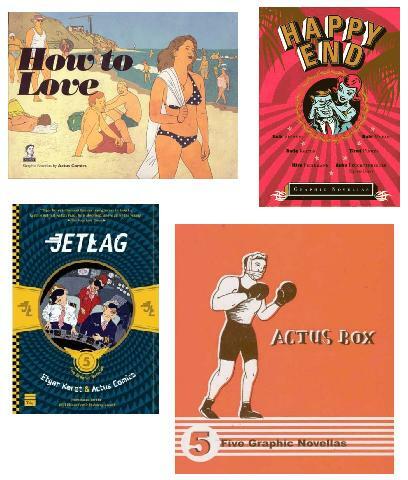 These are usually anthologies including a single story by each writer, and often make their debut around the time of the Angoulême International Comics Festival in France. Nine Actus Tragicus collections have been published so far, often in vastly different formats and styles, including Jetlag , based on stories written by Etgar Keret, and How To Love , their latest collection. 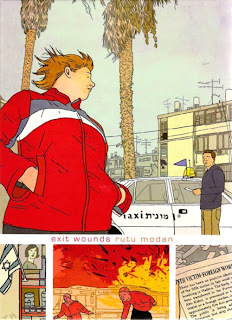 The most successful of the group is Rutu Modan, who has also published Exit Wounds which won the 2008 Eisner Award for best new graphic novel (and is one of the best I've seen in recent years), as well as a graphic serial and a visual blog for The New York Times. 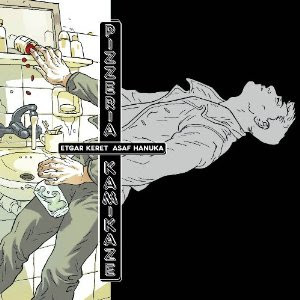 Other Israeli comix artists active abroad are twin brothers Asaf and Tomer Hanuka, the former known for Pizzeria Kamikaze , an adaptation of a story by Etgar Keret, and the latter for The Placebo Man . It is my sad duty to report that Dudu Geva, the greatest of all Israeli Comics artists (and one of the greatest satirists in any medium), has never been translated into English (except for a short English-language cartoon called "Super Golda", published in1972 by some obscure Jewish student press service, wherein Golda-Meir must fight intellectuals who criticize her government's policies). There could be several reasons for this - perhaps because he is of a slightly older generation than the Actus group and never wrote extensively for an international audience, perhaps because most of his work was originally featured in newspapers and often commented on current events, or perhaps because his writing was quintessentially Israeli in language, subject matter, and tone. Nevertheless, much of his work addressed universal themes of existential despair and the attempt to find happiness and meaning in an essentially meaningless and uncaring universe. This is most often expressed through the nameless duck character, which in time served as a stand-in for Geva himself. Geva unfortunately passed away at a relatively young age and, as often happens with such figures, was quickly embraced by the establishment he rebelled against his whole life (including the erection of a statue of the duck in his honor). His early books, which he had to fight to get published (including a well-publicized case brought against him by Disney, who successfully sued him for the publication of Moby Duck, claiming it infringed on Donald Duck) are now sought-after collectors' editions, and several new books collecting his older works, and even unfinished sketches, came out since his passing. An English edition of his work, however, seems to be nowhere on the horizon (but if anyone's interested in the project, I'll gladly research, collect materials, edit, translate, or do anything else necessary to make this happen).